Usher's son Usher Raymond V is in the ICU at an Atlanta hospital after a serious accident in a residential pool Monday, TMZ has learned. Sources tell TMZ, the accident occurred yesterday just after 2 PM in Atlanta. We're told Usher was not there at the time. Here's what we know ... The child was playing in the pool with his aunt and saw a toy in the drain. He dove down to get the toy and his arm got stuck in the drain. The aunt immediately dove in to rescue him but couldn't get his hand out. The maid then dove in and tried but was also unsuccessful. The maid screamed for help. Two audio-visual contractors working in the house came out, dove in and freed the boy. One of them administered CPR immediately and rushed to the hospital. The boy was "conscious, alert and breathing. People connected with Usher tell us he rode with his son to the hospital in the ambulance, but according to the police report, Usher met his son there. 5-year-old Usher Raymond V is the oldest of Usher's two sons with ex-wife Tameka Raymond. We're told Usher and Tameka are currently at the hospital. Doctors have been running a series of tests and doctors say he'll be ok. 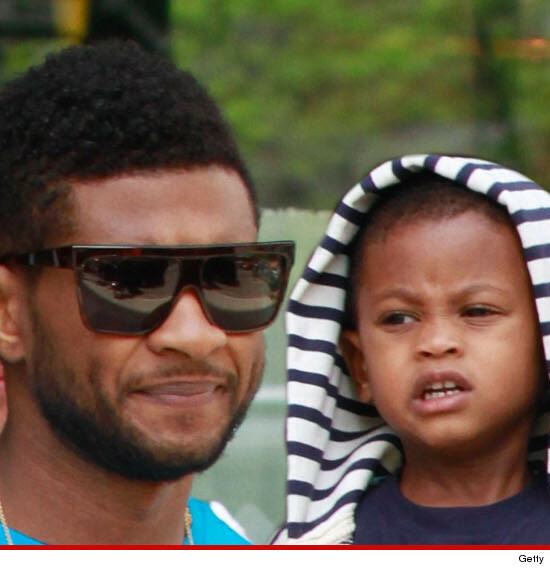 This is the second accident to strike a child in Usher's family. Tameka's 11-year-old son Kile from a previous relationship passed away last year from injuries sustained during a jet ski accident.